Why carry something when you can pull, or even push it along? The days of struggling with your luggage through a busy airport are long gone. Most travelers now invest in wheeled suitcases instead of the traditional hold-all or basic suitcase. In fact, modern suitcases can double as seats and wheel in all directions; you don’t need to just pull them behind you. But what if you avoid the luggage queue and just have carry-on luggage? Most suitcases are too big to count as carry-on which leaves you with a backpack or a small hold-all. Fortunately, there is a wheeled solution. The rolling backpack is the perfect solution for airports, trains, and even buses. It is convenient and practical, especially if you are carrying a lot of weight or suffering from a bad back. The idea of rolling luggage actually started in 1987 when the owner of Travelpro, Bob Plath, decided he needed a better way of getting his luggage through the airport; where he worked as a pilot. Within four years he had to quit as a pilot to focus on the rapidly expanding wheeled luggage market. In fact, his company revolutionized the travel industry throughout the 1990’s. Of course, this was just the beginning, integrated wheels and extending travel handles have become the norm in almost every type of luggage. It was simply a matter of time before rolling backpacks became the norm. It doesn’t matter whether you are booking a holiday, attending a business trip, traveling the world or even looking for something that can comfortably carry your work items to and from the office. Now, if you are after rolling backpacks there are a huge number of options available on the market; this can make it exceptionally hard to know which the best ones for your needs are. Fortunately, this guide is here to help, not only will you discover the best 10 rolling backpacks currently available, but there is also a handy guide to how to choose the right rolling backpack. The most attractive or even the most expensive is not always the one that will suit your best; as a rolling backpack is an investment it is important to find the one that will give you years of service and take all your clothes and other belongings. You should also remember that rolling backpacks do not need to be huge, they can be small enough to use as school bags to ease the load on your child as they move between classes. This is actually described as a laptop bag but it can be used for virtually any purpose. The bag is available in black, brick and black or navy blue and black; all the combinations look stylish. This is a good choice when you need to look professional at the office or on a business trip. You should note this is a medium-sized backpack; you can get a lot of gear in this one. It measures 21 inches high by 14 inches wide and weighs 7.3 pounds, capable of giving you 2350 cubic inches of storage space. The bag is made from a Waffleweave Duralite material which is 600 denier and exceptionally durable and easy to wipe clean with inline skate style wheels. The bag is split into several pockets; the main compartment has a sleeve section which can accommodate any 15-inch laptop and most 17 inch ones. In front of the main compartment is a secondary compartment which is big enough to accommodate A4 folders and books. A third, smaller compartment is situated in front of this one with a number of internal pockets. These are slip style pockets for your pens, notepads, cell phones, and even your bank cards. There is also a zip mesh pocket and a covered media pocket along with a key fob to ensure your keys are both safe and you know where they are at all times. An additional feature which is excellent is the headphone port coming directly out of the media pocket; allowing you to listen to music while on the move and keep your cell phone or media player safe. In addition to all this space, there is a smaller side pocket on each side of the bag which will allow you to keep all the essentials close; you can even store a water bottle in them. The pull-up handle extends to 41.5 inches and is made from double tube alloy. Of course, there are two straps on the back to enable you to carry this as a backpack when required; these are contained inside a zipped section at the rears of the bag. This ensures the bag retains a professional look and the straps do not get tangled when wheeling the bag across the floor. There are reflective strips across the bag at angles to ensure it stands out at night and the carry handle is made from a padded mesh to ensure it is comfortable when you need to lift it quickly. The wheels are mounted at the sides with a kick plate underneath, this ensures there is no risk of damage to the bag and helps the backpack to roll smoothly and responsively on any surface. In fact, the wheels have a bridge which helps to keep them balanced. This bag retails for between $60 and $75 which represents excellent value for money. 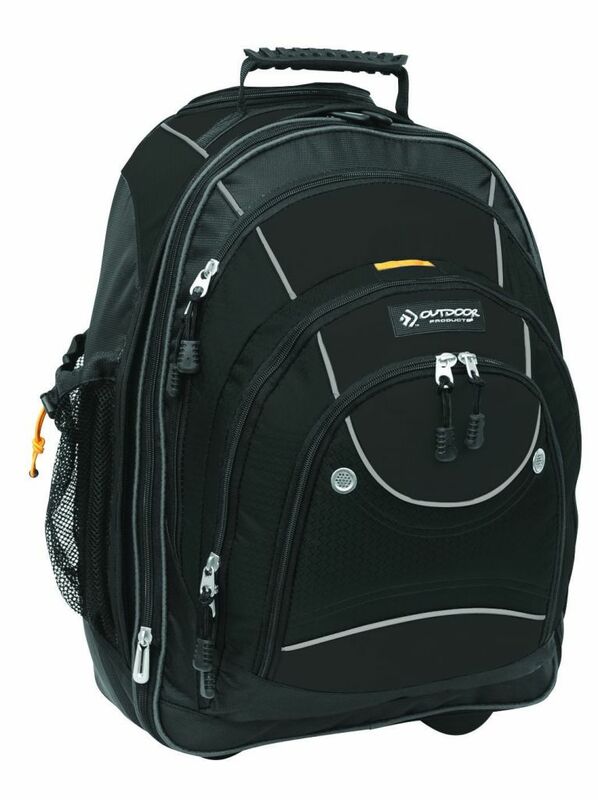 Whether you are commuting or traveling this bag is one of the most versatile and professional looking ones that you will find and a serious contender for the best of the rolling backpacks on the list. 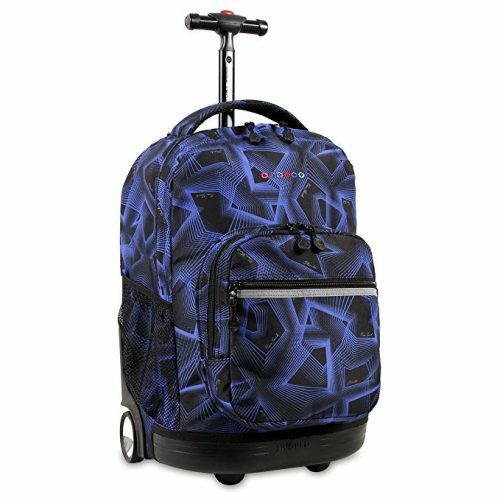 If you are looking for something a little more fun and perfectly designed for the school day then the J World Sunrise rolling backpack is worth considering. J World has a huge range of rolling luggage options, all of which are vibrant and aimed at the fashion conscious individual. Each of the designs is unique and innovative with a range of useful features. The bag is relatively compact at just 18 inches high by 13 inches wide and a depth of 9 inches. This makes it comparable to the standard non-wheeled backpacks available although with a greater depth. It has padded and adjustable shoulder straps which use air mesh to help prevent heat build-up. These can be adjusted to ensure the bag sits comfortably on your back. In addition, the straps can be slipped into sleeves on the back of the backpack to ensure they are safely out of the way when you are wheeling. This can be done in seconds which is important when you are trying to keep up with your friends. The bag weighs a reasonable 4.9 pounds that ensures it can be comfortably carried for short distances by your child. The extending handle is made from aluminum and locks into place with an additional two locking positions when extended. The maximum height of the handle when extended is 34 inches and 39 inches respectively. 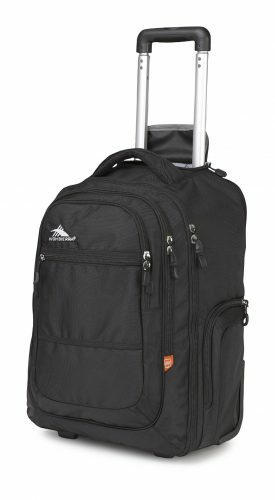 The J World Sunrise rolling backpack is made from polyester which is 600 denier and treated to ensure it is water resistant. The zips are a light alloy to ensure they are both strong and smooth; the zips and the extending handle will not rust. It has a double zipper which provides security for the items you are carrying. 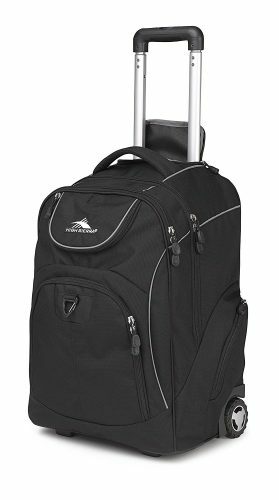 The style of this rolling backpack is the same as a traditional backpack with a curved top, one main compartment, and an outer pocket. However, it arrives in a stylish patterned blue and black which looks fantastic. The main compartment has a mesh lining for storing important items. It should be noted that this is not designed for your laptop. The bag is big enough to accommodate any 15-inch laptop and most 17 inch varieties but you should have a sleeve to keep the laptop safe from being scratched by other items in your bag. It will easily accommodate a laptop, a couple of A4 binders and a selection of school books. The outer pocket is split into a useful series of compartments which will provide you with the perfect slot for a notebook, some pens, ruler, ID cards or wallet and even your cell phone. There is also a key fob to secure your keys inside your bag. Finally, you will be pleased to note there is a mesh pocket on each side, suitable for a water bottle, umbrella or anything else you can think of! 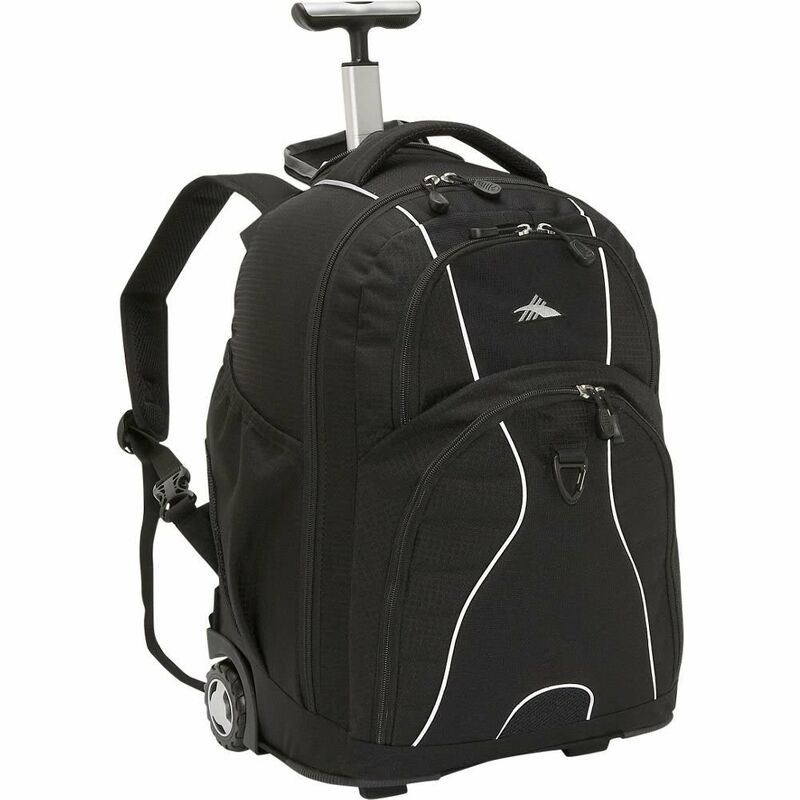 The wheels on this rolling backpack are also inline skate style and are smooth, almost silent when new. They are situated at each side with a bridged section and forward bumper stops to protect the bag and keep it rolling straight. At under $50 this bag represents excellent value for money. It is made from a water-resistant Duralite waffle weave with a trademarked Ripstop addition to preventing rips from occurring in the fabric. It is exceptionally tough but flexible and should last for many years. You will find the standard Vapel mesh straps which are padded and extremely comfortable. These can be tucked inside a specially designed pocket on the back when not in use; ensuring they will not get tangled in the wheels or your feet. The bag is 20 inches tall by 13.5 inches wide and 8 inches deep; this allows it to accommodate laptops up to 17 inches in the specifically designed inner sleeve of the main compartment. It weighs a respectable 5.3 pounds allowing you to carry it easily on your back when needed. The extending pull handle is enclosed in a zipped compartment and locks into place. One click will allow you to extend this aluminum single tube handle extends 8.25 inches from the bag allowing almost anyone to comfortably pull the bag along. The main compartment has the padded laptop sleeve and plenty of spare space. In front of this, the traditional style of this backpack means there is a secondary pocket in front. This is almost as tall and wide as the main compartment but only capable of holding relatively slim objects. It can still hold an A4 pad. At the very front is the third pocket with dedicated drop style pockets. There are five of these in different sizes which could house a tablet, cell phone, calculator, notebook and small wallet! Coming from this pocket is a hoe for your headphones to allow your music player to stay safe while you listen to music. Of course, this is more practical when the backpack is on your back, the cable trailing from this pocket to your ear when pulling the bag would need to be rather long and could cause a hazard. There is also one slip pocket on the side but this is narrow, it might not be possible to get your water bottle into it. The bag should be able to handle 3 or 4 textbooks that are 2 inches thick in the main compartment without any issues or squashing your laptop. The bag is small enough to be put into a standardly sized locker at school or even when traveling, this makes it an excellent choice for a school bag or a carry-on. With a little clever packing, you could easily fit everything you need for a weekend away in this stylish backpack. It is always good to know who you are buying your products from. JanSport is dedicated to making and supplying the best quality backpacks; they have a huge range available from the traditional style, to the duffel bag and some exceptionally funky bags. The company has been operating since 1967. They have had plenty of time to get it right and this shows in the products they have on the market today; including the Driver 8 Core series. This rolling backpack is available in a wide selection of colors, including black, navy, confetti, dotted black, floral gray haze, green with white dots, shadow chevron, and spring meadow; the list goes on! 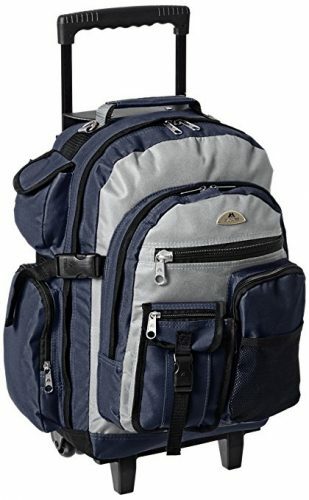 This is another of the rolling backpacks which keep to the traditional style of the backpack; the curved top runs smoothly into a convenient carry handle that is situated just in from of the extending handle pocket. In fact, the only clue from the front that this is a rolling backpack is the two bumpers at the bottom of the bag; to prevent it from scuffs. It is made from high-quality nylon which is water resistant and extremely durable although surprisingly soft to the touch. It is a mixture of 600 denier polyester and 420 denier velocity which is highly durable. The bag measures 19 inches high by 14 inches wide and a depth of 8 inches. This allows plenty of room for any laptop up to 15 inches and even some 17-inch ones; there is even a dedicated sleeve to ensure it is well protected while you travel. With a weight of 4.3 ounces, it is easy to carry this on your shoulders when needed. The shoulder straps are wide and well padded as well as being adjustable to provide the maximum level of comfort possible. These tuck into the back when not needed to keep the bag looking great and prevent the straps from getting tangled. The wheels are mounted on the side and are the largest in this selection; an impressive diameter of 80mm ensures they are able to travel effortlessly across any surface. The pull handle is a single pole but exceptionally strong and tucks nicely into the front of the bag. It can extend to a maximum height of 40 inches, ensuring it is comfortable for virtually any size person. The single pole has a ‘T’ bar style to allow for easy grip when you are moving through any crowd. There are a number of useful pockets included in this rolling backpack; the main compartment is split into two pockets, both with double zips to ensure the items can be securely locked away. In front of this is the laptop compartment with its own double zip feature. There is another pocket at the front of this backpack designed for accessories. It is big enough to accommodate your wallet, cell phone and a variety of other essentials. This bag retails for between $90 and $120 making it one of the more expensive options of this list. However, the quality f this brad is undeniable and worth the investment. 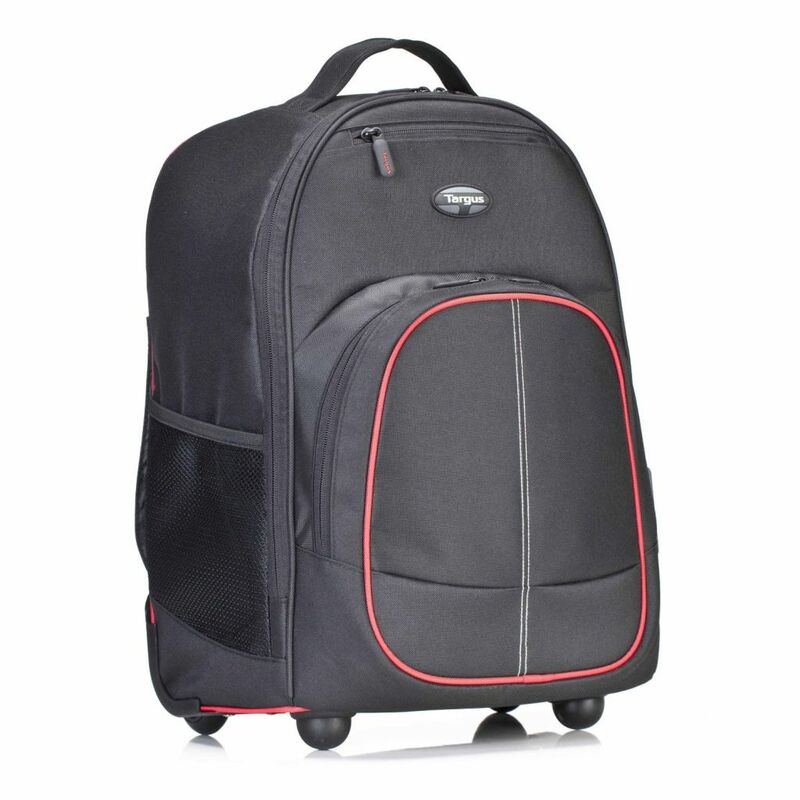 This is a big, stylish and well made rolling backpack which will be the perfect solution in a myriad of different situations. If you’re in need of a bag that can carry your school books in term time and then accompany you traveling around the world you may have just found the perfect solution. This is the second offering from J World which has made the best 10 rolling backpacks list. It shows the dedication and commitment this firm has to provide the best possible luggage for your every need. The fact that this bag is available in a huge range of colors simply adds to its appeal. You can choose from block navy, aloha, black, atlas, autumn, pink, blue raspberry and many more; there are 37 different color schemes in total; all of them bright and vivacious. The bag itself is made from 100% polyester; it is 600 denier which is exceptionally durable, even without looking after it. 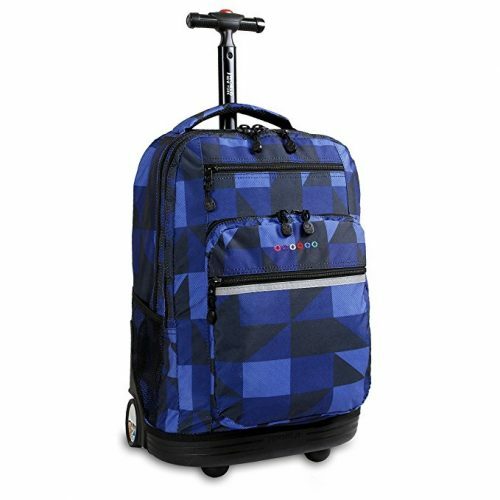 This rolling backpack measures 20 inches high by 13 inches wide and 9 inches wide; big enough to handle your school books or travel items without looking like you are hiking around the world. The single pole handle slides neatly into the bag and is made of aluminum to ensure it won’t rust. It locks into two different positions to ensure it is the perfect height for pulling behind you, whether for an adult or a child. The maximum height is 21.5 inches. The zips are all silver with useful oversized tags to facilitate closing them easily. It does adopt the traditional style of most rolling backpacks. The soft carry handle protrudes from the top of an otherwise flat bag. There are two main compartments with zips over the top and two-thirds of the way down the sides of the bag; this allows easy access to the interior compartments. These are both fitted with double zips that enable you to lock the bag securely up, if necessary. The inner of these two compartments has a padded sleeve with a locking Velcro strap. This is designed to hold your laptop in place and protect it while you travel; you should comfortably fit any 17-inch laptop in. In front of this, there are a further three pockets. One is designed as slim, slot type pocket although it does have a zip closure. This is useful for an A4 book; providing it is not thick! At the front, you will find pocket number four which has an organizer inside it. Mesh pockets provide you with space for pens, bank cards, your cell phone, and even a notepad or calculator. On the outside of this pocket is a further slimline pocket just large enough to handle your cell phone, or a similarly sized object. There are also mesh pockets on each side to help you carry water, (or any other liquid you might need). The wheels are set at the sides with a robust plastic bottom and additional bumpers on the front; protecting your bag and its contents from most bumps and scrapes. You will also be pleased to note that the adjustable back straps are made with Air Mesh and well padded when you need to carry it you will be comfortable doing so! The straps are tucked into the back when not in use, making them disappear and allowing you to safely pull the backpack anywhere. At between $40 and $60 this could easily be classed as the best value for money option on this list. 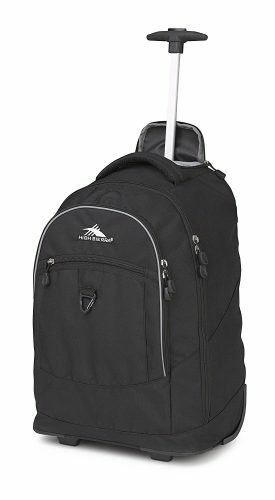 High Sierra is a well recognized and extremely reputable brand. They promise to deliver high-quality items which will provide you with space and convenience you need for any trip. Their bags generally live up to their reputation which is why there are three bags on this list so far and a fourth to go! The Chaser can be used as a school backpack but it would also not look out of place in the office, especially if you need to carry a lot of items back and forth each day or make regular visits to other offices. This particular example is made from tough 600 deniers Duralite which is known to be long lasting and scratch resistant in most situations. The backpack measures 20 inches tall by 13.5 inches wide and a reasonable depth of 8 inches. Despite the telescopic handle and robust base, it weighs just 5.13 pounds. You should be able to purchase the Chaser for between $50 and $70 which puts in the same arena as the J World offering. However, while the quality of both bags is excellent the J World potentially has the advantage on the pocket number and overall versatility. But, the Chaser can boast a more professional looking bag for those in IT support roles or even auditors. As well as plain and smart black you can get this bag in true navy, crimson or even pink. If you prefer the funky look then there is a good range of two color combinations including flamingo/charcoal and tropic leopard/teal. Like many of the rolling backpacks, this one has a single pole telescopic handle which slides neatly into the bag just behind the padded carry handle. The pole handle can be completely hidden by zipping the compartment shut. You can then release the rear straps from their clips and easily convert it to a backpack. The rear straps are easily adjusted to suit a child or an adult, they are well padded and breathable that makes sure you are comfortable regardless of how long you need to carry it for. The wheels are in-line skate style with smooth bearings and a plastic bridge to help keep them balanced and rolling in a straight line. The base of the bag is also supported by the plastic coating and the two bumper stops prevent scuffs while also keeping the base off the ground. As the material is water resistant this is a great way of ensuring your contents stay dry. Although the bag is extremely spacious it is designed more like a suitcase than a traditional backpack. There is no dedicated pocket for your laptop although it will easily accommodate a 17 inch and many 19 inch laptops. You will need to put them in their own padded sleeve. The main compartment has a double zipper function which goes right to the base of the bag, allowing you to open it fully for excellent access. In front of this is a second compartment which is approximately half the depth of the main one; three inches compared to the six of the main one. It is also fractionally shorter but does have the same double zipper function. At the very front is the personal organizer pocket. This has a variety of internal slip pockets which will allow you to store your tablet, wallet or calculator, a selection of pencils, two or three notebooks and even your headphones or cell phone. You will also find a key fob to keep your keys safe during the day. This pocket also features a double zip function. Finally, on the side, there is one mesh pocket which is perfect for your water bottle. This is the first of the rolling backpacks which doesn’t adhere to the conventional design. Although still well designed and well built it has more of a satchel or messenger bag look but combined with an extremely professional and trendy crinkle finish. This is due to the crinkle nylon which has been used to make it. The backpack is still rectangular but slopes in at the top creating the satchel feel. However, the customary pockets on each side suggest backpack; allowing it to create its own unique and very appealing look. The embossed logo on the front, the detailing in the stitching and the quality of the product make it well worth the price; currently in the$150 to $180 price range. Add in the fact that there is a good selection of color choices, such as black, navy, berry and blue and you will see why this is a desirable bag for any professional. This is not the largest of the rolling backpacks, measuring 18 inches high by 16.2 inches high and 8.5 inches deep. It will only accommodate a 15-inch laptop but does provide enough space for all the accessories and school books or travel items you may need. The single pole aluminum handle can be completely hidden inside a zip compartment but it also extends in three stages, providing enough variety to ensure it can be comfortably rolled behind any adult or child. The rear straps are well padded an adjustable but also feature a unique ability to be unclipped at the bottom. This will allow you to turn the bag into a shoulder bag or even a sling backpack. Unclipping them also allows you to tuck them away inside a padded pocket, leaving you with a professional looking wheeled suitcase and no straps to get tangled up. The base of the bag is molded plastic to prevent scrapes and water from damaging the material or the items inside. There are two small wheels inset from the sides in dedicated grooves which are sturdy and smooth. There is also the customary bumper stops to prevent the bag from tipping over or moving when stood. You will be pleased with the number of pockets and the soft, checkered interior. The main compartment has double zips which go right to the base of the backpack, allowing it to open suitcase style and making packing simple. There is a padded pocket with Velcro strap to hold your laptop in place. Over the top of this pocket is a flap with its own small zip pocket, perfect for accessories you need to grab quickly while on the run. At the very front is the smaller accessory pocket which can accommodate your notebooks, a small tablet, cell phone and even your wallet. To finish the bag has a pocket on each side which zips shut. These could accommodate a water bottle although the zip would need to be left undone. This is a well-built example of a rolling backpack although you need to remember it is one of the smallest on this list, even if it is one of the best looking! High Sierra’s fourth and final entry on the best 10 rolling backpacks list is the Rev and it has a distinctively more suitcase feel. It can be purchased in black, gray or blue; all colors look fantastic and are good options for school use or traveling as it will show minimal dirt. It has multi pockets, enabling you to store everything you need in one easy go. It is also extremely tough as it is made from 1680 denier ballistic nylon. 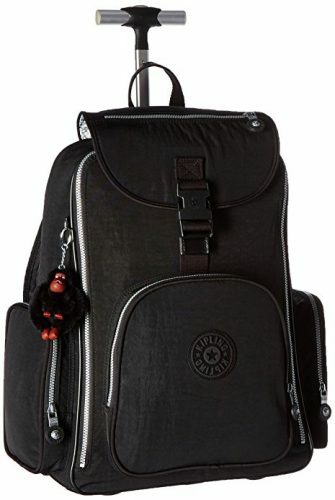 It is probably the toughest backpack on the list; at between $70 and $90 it also represents excellent value for money. The Rev measures 21 inches tall by 14 inches wide and an impressive 9 inches deep; it is certainly not the smallest offering on this list! However, it weighs just 4 pounds making it light enough to be carried anywhere. As with most of the rolling backpacks, there is a telescopic handle for pulling the bag, this stores neatly into the back of the bag under a zipped cover. What is different is that this two-stage handle is twin pole with a conventional handle; it is less likely to slip out of your hand when moving through crowds. On the back of the Rev are the customary straps which are well padded and fully adjustable, there is also a fold down pocket which contains the straps perfectly when you do not need them. This zips shut to ensure they remain out of the way. This flap also doubles as a wheel protector when you are using the rear straps, effectively protecting your clothing! Underneath the bag is the standard plastic coating to protect your contents; this curves up between the wheels on the rear to add a little touch of style. The wheels are inset in their own grooves to protect them and help to ensure the backpack rolls smoothly across almost any terrain. The main compartment features a standard backpack double zip which allows access to the top of the bag, allowing you to slide multiple items in safely and securely. It can also zip around from the top of the left side to the bottom of the left side; allow you full access to the interior pocket. In front of this is a secondary compartment, also double zippered. This is well padded and designed to handle your laptop; it can hold most 15 inch laptops. The exact dimensions are 15 inches by 10.25 inches by 1.5-inch depth. You will also find a dedicated sleeve in this compartment for your tablet. This is an unusual and very welcome addition to the backpack. It can handle tablets as big as 12.5 inches by 11 inches by .75 inches. In front of this is another pocket, designed to help you stay organized. This is where there are several internal drop pockets which can accommodate your pens, pencils, notebooks, maps, electrical cables or ID card/wallet. You will even find a key fob for securing your keys; if needed. The final pockets are fitted to the side and complete the versatility of this stylish backpack. They are both zipped but are big enough to hold your water bottle or a similar sized item and can be exceptionally useful! 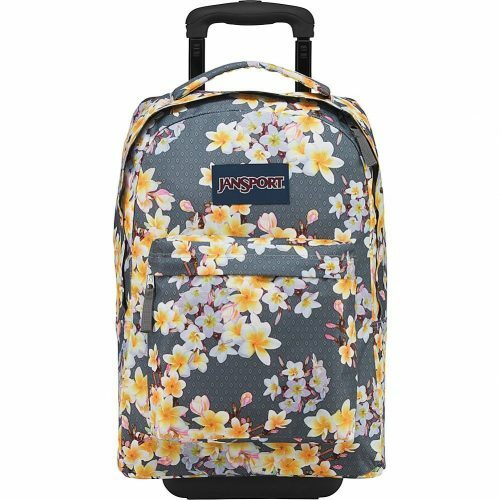 Jansport has also earned a second place on this list through the quality and style of their rolling backpacks. You can choose to purchase the Superbreak in plain black, but you are more likely to opt for one of the funkier colors, such as diamond plumeria, speckled space, tropical mania or even purple Spot-O-Rama. As the names suggest these are bold and bright designs, not something for the faint-hearted but they will help you to locate your luggage easily at school or in the hold of the coach after your latest cross-country trip! These are designed to make a statement and they do it very well. The bags are made from the standard 600 denier polyester which ensures they are waterproof and tough, resistant to most scratches and even dirt should brush off easily. It measures 19 inches tall by 13 inches wide and 9.5 inches deep and weighs a comfortable 5.4 pounds. As always there are well-padded straps with a breathable outer layer to ensure your comfort when the bag needs to be on your back. The straps are neatly folded away into a pocket on the rear; the bottom of the straps unclips to ensure safe storage and the pocket is padded to protect your back when using it. The telescopic handle operates on two black aluminum poles with a soft but solid plastic grip across the top. It can be locked into two positions or tucked discreetly away into the backpack. The wheels are relatively small but set at the outer edges of the bag to ensure smoothness and balance. Despite the funky colors, this backpack adopts a very standard backpack style approach. It has a slightly curved top with a padded carry handle rising from it, other than this it is relatively rectangular in design. The only other clue from the front that is a rolling backpack is the plastic bump plate at the bottom. This has been redesigned to increase durability in the latest update of this backpack. The main pocket is double zipped, the zips are set at the very front of the top and wind halfway down the sides of the backpack; providing adequate access to the contents and allowing you to stack items inside, especially books. However, there is no dedicated pocket or strap for your laptop, although it would easily accommodate most 17 inch laptops. The biggest flaw with this backpack is that it only has one other pocket, the small accessory pocket on the front. This is big enough to handle a small tablet or your notebooks, pens, calculator, wallet and cell phone but there are no drop pockets to help you keep organized. While this is a spacious and sturdy backpack which justifies the price tag of between $75 and $100, it would benefit from more pockets to organize your gear. If you don’t mind struggling to find smaller items in the bottom of your bag this is an excellent choice for traveling or school; it probably isn’t the one you want for your office based job. With a name like Everest, you would be forgiven for thinking this is the one you need for mountain climbing. But, like all the rolling backpacks on this list, it is much more versatile than this. It does have the look of a more conventional styled hiking or camping backpack with multiple pockets situated all over it. You will certainly not struggle to find somewhere to put all the little bits and pieces essential to your trip; although you might not remember where you put them all! 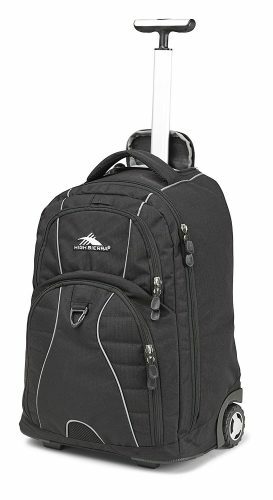 The Everest Deluxe retails between $40 and $60 which makes it one of the most attractive options on the best 10 rolling backpacks list. It is made from polyester to ensure it is very durable and offers a good level of protection against the rain. The deluxe measures 21 inches tall by 13 .8 inches wide and 7.1 deep; although with all the pockets stuffed it is much deeper than this! You can choose between black, burgundy, pink, purple, khaki, navy and turquoise. The standard rear straps are extremely well padded and adjustable to ensure comfort while traveling but it should be noted that there is no method of tucking these out of sight when not in use. The pull handle tucks neatly into the back of the bag; it runs on two aluminum poles and locks in two different positions to ensure it is usable by children or adults. This sits above your shoulders when being carried as a backpack so should present no comfort issues. There is one front bumper and the rear wheels are inset slightly but in their own plastic sleeves; this ensures they run straight but are far enough out to keep the bag balanced at all times. It should remain standing even if you only load the outer pockets and not the main compartment. The bolt on the frame at the bottom lifts the bag approximately 1.5 inches from the floor; helping to protect your contents from bad weather and other clutter on the ground. The main compartment has a smooth double zipper system to provide peace of mind. It unzips as far as the bottom of the backpack to allow unfettered access to the interior compartment. There are standard plastic clips to help hold the backpack shut and reduce any pressure on the zips. Disappointingly there is no padded sleeve for your laptop although the bag can hold any 17-inch computer. There is a sturdy carry handle at the top of this compartment with loops for attaching any essentials. In front of the main compartment, you will find a second compartment which is easily big enough to support a tablet or an A5 pad. This is complemented by a smaller pocket inset into the front of it, useful for keeping any travel documentation or similar sized pieces of paper. There are then a further three pockets on the front of the bag. Two of these are zipped and cell phone size with a third one being a mesh pocket, also capable of holding a cell phone; although you may not want to use it for this for security reasons. In addition, there are two large zipped side pockets designed to hold a water bottle or something of a similar size. Looking from the front, on the left side, there is a secondary side pocket above the zipped one. This is a Velcro pouch and could be useful for keeping essentials within easy reach; although it should be noted this is not big enough to house your cell phone. The backpack s one of the best rolling backpacks available considering the quality of the build, its durability and the multiple pockets available. It is this design which will leave you either very satisfied or looking elsewhere. If you like lots of compartments then this is the backpack for you. If not, there are 9 other rolling backpacks on this list; one of which is perfect for your needs. There is no doubt that once you start looking for a rolling backpack you will realize that there are hundreds to choose from; it is not an easy decision. After all, you need something that will give you the right amount of space at the right price but still convey the right look and your personal style! Size matters! Quite simply you need the right size bag for your possessions. Most of the rolling backpacks in this guide are approximately 20 inches tall, but even if they are the same height that does not mean all the bags have the same capacity. Think carefully about the items you will be carrying on a regular basis or what you will need for a special trip. Then you can make sure these will fit into the backpack you choose. Size is about more than just the cubic space available, you need to consider the measurements of the bag to ensure it can handle your laptop and other items. You should also consider the size of the backpack in comparison to your own size; it should fit comfortably on your back; avoid getting one which is too big as this can cause back strain when you do need to carry it. Most rolling backpacks have a dedicated space for laptops; it is important to make sure that your laptop will fit into the backpack you choose. Of course, if you don’t have or don’t need to carry it then this should not be an issue. In addition, you will need to consider how important multi pockets are to you. It can be extremely useful to have a separate place for your tablet, cell phone and keys. A slot for your water bottle is also useful. However, your need for pockets is dependent on what you are intending to do with your bag. It is worth considering your intended use of the bag to decide whether multiple pockets are needed. Whenever you think about purchasing something new it is a good idea to set yourself a budget. The price of rolling backpacks can vary and it is easy to be attracted to one which is outside of your budget. While this may be frustrating it is worth remembering that some of the best quality backpacks are not the most expensive ones. Setting a budget will help you to target your approach to those backpacks which are affordable and practical. This is better than finding the bag you want and then realizing that it is well over your budget. This guide should have illustrated that there s a huge range of different looks for your backpack. While the more somber colors such as black and gray are great for a professional image, the more funky color schemes could be just the ticket for anyone looking to go traveling or needing a sturdy backpack for school. But the look is more than just color; the rolling backpacks that have specific pockets to keep the straps safe have much smoother lines. The traditional backpack style is functional and spacious but there are other options, especially if you like to break the mold. You should consider this before you commit to a backpack. Your intended use will make a difference to your choice of backpack. The varieties with multiple pockets and straps which tuck out of sight are exceptionally well designed for traveling with. However, if you are planning to purchase a rolling backpack for the daily commute you might think it is a good idea to make sure that it has a flap to cover the wheels and protect any dirt from getting on your clothes. Most of the rolling backpacks you will see have wheels on the outer edges; this is to help with balancing the bag and ensure it runs smoothly while you pull it along. However, the quality of the wheels and the bearings will make a difference to how smoothly it will run over time. In addition, the balance is only part of the equation. You need to look at how the wheels are mounted and what support is placed between them; this is important to ensure your luggage is well protected and the wheels are supported well enough for continual use. 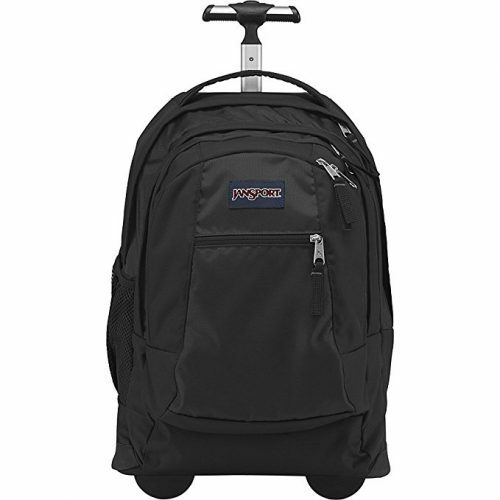 If you are planning to purchase a rolling backpack then it is likely that you will be pulling it much of the time and will want sturdy wheels. It is possible to purchase a rolling backpack in a variety of materials but the most common and popular s nylon or polyester. This is a tough fabric which is flexible and water-resistant; it can also be created in a huge range of different colors and patterns. However, this is not the only option available. In many instances you may not be concerned about the material used, but if you have concerns about animal products or any other issues you should verify what the backpack is made from and where it was made. Rolling backpacks have pull handles which extend to ensure you are comfortable as you pull the bag. These are generally made of aluminum which does not rust. However, they can be a single pole or twin pole; this affects the design of the handle and your comfort while pulling. You may not have a preference but it is worth testing both types of handles before you choose a rolling backpack. You should consider the color of the backpack in conjunction with your intended use. While some look fantastic they may not provide the desired impression when you turn up at work or even school. The rolling backpack is extremely useful but this does not mean that you should settle for anyone. Finding the right color and pocket combination is not always easy but, if you have thought about it and know what you want, it will be much easier. A manufacturer is judged by their reputation and since the increase in social media, this is an incredibly fragile thing. It is very easy to speak to a wide number of people who have actually purchased and used the bag you are thinking about buying. Every person will be able to tell you a story and they may not all be positive. It is important to consider the overall view of a specific bag before deciding if it is the one for you. While social media gives you the opportunity to hear real experiences you should remember that people are generally quicker to complain than to praise. Read all the comments carefully and judge the product by the overall trend before making your own decision. Don’t Forget Your Needs Can Change! Finally, you need to remember that your perfect rolling backpack may not be your perfect one forever. Your circumstances and needs will change over time, it is virtually guaranteed! In terms of choosing a backpack today, you should remember that it needs to be practical but it can also reflect your personality. Select the best possible match for today and worry about tomorrow another day! The rolling backpack is an excellent idea as it combines the convenience of a backpack with wheels which can save your back a huge amount of strain. But, you must choose one which is going to give you the quality and space you need for everyday tasks. The 10 best rolling backpacks as listed in this guide are all worthy of consideration. But it can’t be stressed enough that the intended use of your backpack should be the first thing you think about. You should then consider how it will load and the best way of packing all your relevant articles in. Of course, packing to go hiking or traveling is very different to what you will take to school or the office! Whatever you are intending to do or go with your rolling backpack you will find that it is a far easier way of traveling. Most of the ones listed should be small enough to double as carry-on luggage which allows you the freedom of exploring without needing to wait for conveyor belts or letting your precious belongings out of sight. A good set of wheels can deal with most terrains preventing you from straining your back and allowing you to take those extra ‘luxuries’ which may simply prove too heavy otherwise. Once you have tried rolling backpacks you will never go back to the conventional style ones! This is a very good article. I personally used the High Sieara backpack. This is very good. My School going kids also love this. 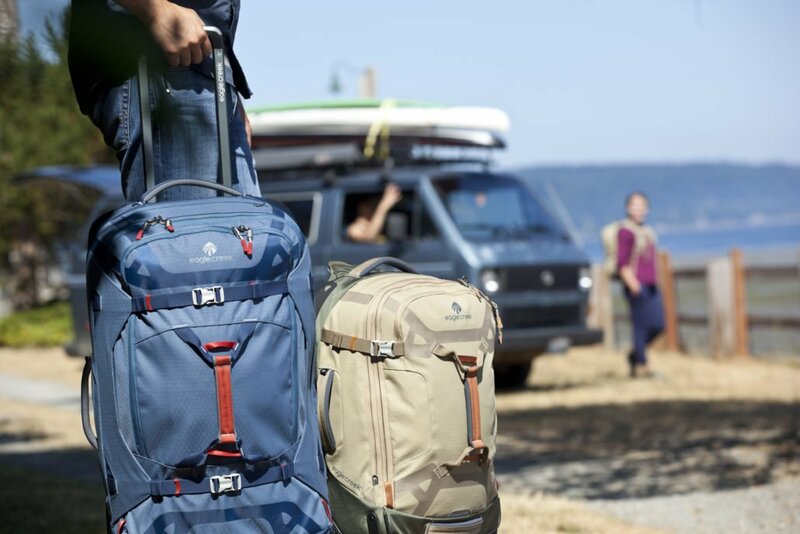 The Outdoor Products Sea-Tac Rolling Backpack is ideal for laptops and has pouches and side zipper pockets that are perfect for other accessories.